Agreement improves cross border communications between the U.S. and Canada. The Federal Communications Commission (FCC) and Canada's Innovation Science and Economic Development (ISED) jointly released documents related to cross border communications. The FCC Public Notice provides guidance to U.S. public safety licensees seeking to: (1) roam into Canada; (2) communicate from the U.S. through base station repeaters in Canada; or (3) host Canadian licensees seeking to communicate through base station repeaters in the United States. Canada's Cross-Border Communication for Public Safety Licensees notice provides guidance to Canadian public safety agencies seeking to place base stations in the U.S. The FCC Public Notice also provides a path for U.S. public safety agencies to operate on Canadian frequencies used by Canadian first responders, which was previously considered to be an ineligible activity. It is significant to note that regulatory solutions have now been created for all three cross border radio scenarios that were previously identified by U.S. and Canadian first responders. This recent agreement provides guidance on the placement and usage of base stations located in Canada to support local public safety operations as well as interoperability. Last year, the FCC and ISED provided regulatory guidance that allows the use of mobile and portable radios at, and across, the international border. The Cross Border Outreach document created by NPSTC and the Canadian Interoperability Technology Interest Group (CITIG) explains exactly what the treaty allows in simple, concrete terms and provides website addresses for further information. The group did not meet in August due to scheduling conflicts with the APCO International Conference. 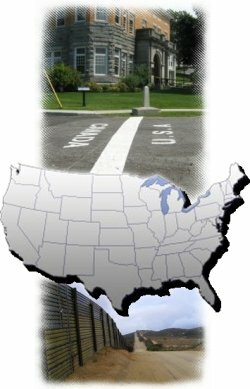 The Cross Border 9-1-1 Data Sharing document will be sent to the Governing Board for approval at the September meeting prior to publication. This report provides guidance to PSAPs in the U.S. and Canada on how to obtain customer account information and location data on callers who have roamed across the international border into their country. Focus on the mitigation of communications issues involving public safety operations in the United States border areas, and proactively work in international regulatory realms to facilitate more effective communications in these border areas. Serve as a focal point for border area public safety communications issues in all bands, as they arise.